Chris Mueller. From Stevens Points Journal. Posted on August 24, 2016. Original article. 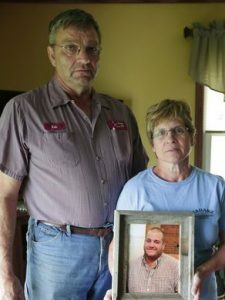 Michael Biadasz died Aug. 15 after being overcome by gases from a manure pit on his family’s farm. His family and friends recently spoke with USA TODAY NETWORK-Wisconsin and shared memories of his life and their feelings after his death. Jacob Byk/USA TODAY NETWORK-Wisconsin. Bob Biadasz was drinking a cup of coffee when the phone rang. He heard a voice on the other end say, “Bob, Mike’s dead.” He ran out the door, but it was already too late. His son, 29-year-old Mike Biadasz, was found on the ground near a manure pit by other farm workers who showed up at the family’s farm near Amherst expecting to haul away manure. It was about 6:30 a.m. Aug. 15, a Monday. 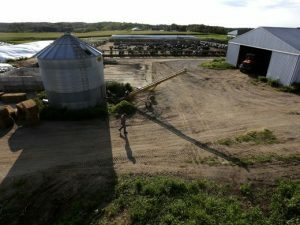 Biadasz was using a piece of farm equipment to agitate — or stir, basically — a large outdoor manure pit to prepare the manure to be hauled away in trucks and, eventually, spread onto fields. The job wasn’t unusual, typically done a few times each year, but this time was different. This time, fumes released from the pit became trapped beneath warm air high in the sky on a foggy morning. Biadasz passed out from the fumes and was lying still on the edge of the pit when other workers found him. He died, and so did 16 head of cattle standing near the pit. Biadasz’s death left his parents and three sisters reeling, wondering what the future of their family — and their farm — could possibly hold without him. And many more people felt the sting that came with such an unexpected loss. More than 1,200 people came to his visitation last week. That’s more people than the 1,038 people who actually live in the village of Amherst, according to the U.S. Census Bureau. The visitation was moved to St. Bronislava Catholic Church because a local funeral home wouldn’t have been able to handle such a big crowd, Bob Biadasz said. “I never realized Mike touched so many people,” he said. Steve Burclaw had only worked on the farm with Mike Biadasz for about three years, but the two quickly became close friends. rning, didn’t immediately see anything out of the ordinary. Burclaw said he returned to his daily work routine this week for the first time since Biadasz’s death, but it hasn’t been easy. Mike Biadasz, who graduated from Amherst High School in 2005, developed an interest in farming as a child, eventually going on to study farming at Mid-State Technical College in Marshfield and Fox Valley Technical College in Appleton. The unusual circumstances surrounding Mike Biadasz’s death motivated his family to start a farm safety memorial fund with collection points at Community First Bank in Rosholt and Stevens Point. A GoFundMe page has also been set up by the family. At least 270 farmers, ranchers and other agricultural managers died from work-related injuries in 2014, according to a study by the Bureau of Labor Statistics. Five of those deaths were the result of someone being exposed to a harmful substance, but most of the deaths were related to transportation incidents or contact with equipment. These deadly situations involving dangerous fumes are more common in confined spaces, but the gases pose a risk and are difficult to detect wherever they’re released, said Cheryl Skjolaas, an agricultural safety specialist for University of Wisconsin-Extension. Many comments included photos of Mike Biadasz with friends, while others simply expressed disbelief. “I never knew how much those words could mean,” Bob Biadasz said.